Staff Sgt. 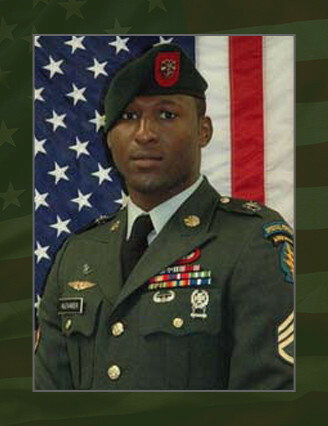 Leroy E. Alexander, 27, was a Special Forces engineer sergeant assigned to 1st Battalion, 7th Special Forces Group (Airborne), at Fort Bragg N. C.
A native of Dale City, Va., Alexander entered the Army in August 1997 and completed One Station Unit Training, at Fort Leonard Wood, Mo. After completing airborne training at Fort Benning, Ga., in April 1998, he was assigned to 27th Engineer Battalion, at Fort Bragg, in support of XVIII Airborne Corps. Following completion of Special Forces Assessment and Selection, Alexander arrived at the 1st Special Warfare Training Group (Airborne) in October 2002 to begin the more than two years of intense training it would take for him to become a Special Forces engineer sergeant. He was assigned to the 7th SFG in June 2004. Alexander’s military education includes the Basic Airborne Course, the Primary Leadership Development Course, the Special Forces Assessment and Selection Course, the Special Forces Qualification Course, the Spanish Language Course, the Survival, Evasion, Resistance and Escape Course and the U.S. Army Special Operations Command Mountain Course. His awards and decorations include the Army Achievement Medal, the Good Conduct Medal, the National Defense Service Medal, the NCO Professional Development Ribbon, the Army Service Ribbon, the Combat Infantryman Badge, the Parachutist Badge, the Air Assault Badge, and the Special Forces Tab. He was posthumously awarded the Bronze Star Medal, the Purple Heart, the Meritorious Service Medal, and the Afghanistan Campaign Medal.